THE SEA GLASS: This sea glass necklace was hand made with genuine, hand picked seaglass beachcombed by me from a shore along the majestic Pacific Ocean. The truly vintage gem is most likely from vintage bottle glass that has been naturally tumbling, most likely for at least 40 - 70 years. BOXED W\/GIFT CARD: It will come on a gift card that tells the short story of sea glass and gives the name of the ocean the sea glass was beachcombed from. MEASUREMENTS & MATERIALS: The snake chain is 17" sterling silver with marked .925 sterling silver lobster clasp. The sea glass pendant, including sterling silver jump ring measures just over about 1" long. The wire around the sea glass is silver plated to hold its shape. QUALITY: All of the West Coast Sea Glass jewelry pieces are made of authentic beach glass that's never altered or artificially tumbled in any way. This gives each piece history and a unique story. 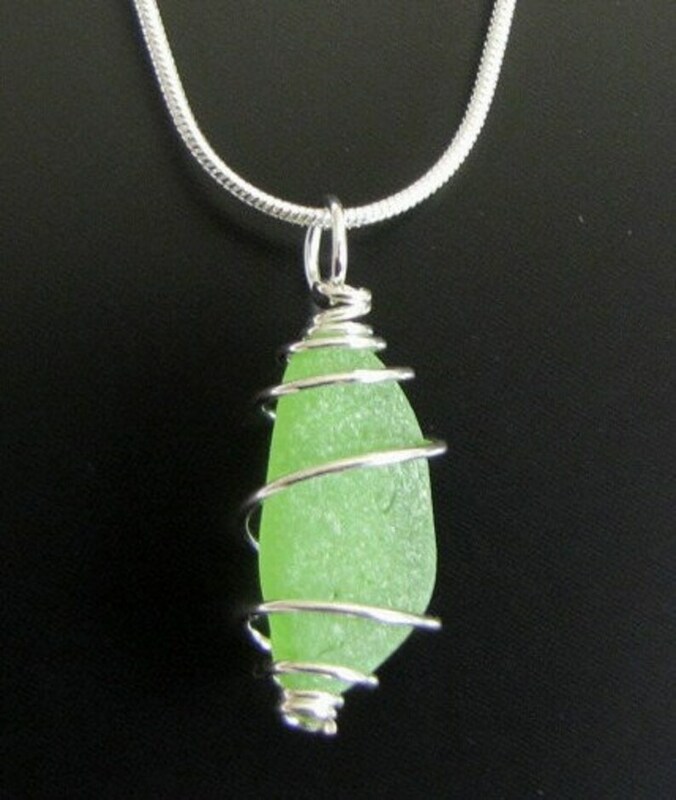 Our sea glass is placed into our artistic jewelry in the same ocean tumbled shape that it was beach comed in. Thank you for fast shipping! The item was exactly as described. Very nice item although it occurs to me that there are so many in between colors and shades. I think once the weather cools off I will separate my glass, photograph and ask this shop for color identification. I do have Mary’s Sea glass book but am very new to collecting. Some day I’ll get to a glass meet. You may checkout via Etsy's Paypal checkout or you may phone our studio to make easy, secure credit card payments. Call the studio number below. We want you to be fully delighted with your purchase. We fully refund or exchange any item within 3 weeks of purchase if for any reason you are not happy with it. We ship worldwide every day! Your item will be shipped out within two business days via USPS. Questions? Just email us: WestCoastSeaGlass@hotmail.com or call the studio number below.